This is never more apparent to me than my first conscious night in Intensive Care. I am heavily sedated but am fully aware of my surroundings – I am in a room with three beds – mine, a young chap who has a serious puking problem which the doctors are able to stem by attaching tubes in the appropriate places, and an empty bed to my right. Not for long. During my first night, I am aware of a man being wheeled into the spare bed beside me. He is in an agitated state. He is shouting to let him go. He is pulling at his cannulas and lashing out at the nurses – biting and punching them. I cannot describe to you the fear and helplessness I feel – I am in no fit to defend myself should this guy get free and run amok. This situation goes on for ages – help is summoned to provide some calming medication to the man, but he seems to be able to rise above it. In the end the nurses bind his hands together like a boxer’s hands are bound inside the glove. This is to prevent him ripping out his attachments and grabbing at anyone close to him. But he manages to get his hands up to his teeth to unravel the binding. It is a most unsettling night – and not what I had in mind as a relaxing good night’s sleep to start me on the road to recovery. I was genuinely afraid. But I am extremely well looked after, almost constantly, by a young doctor – feeding me with cocktail sponges of water till my hearts content and trying to settle me. The next day a couple of events surprise me. Firstly, some chap comes in – to be honest I didn’t know who he was, and still don’t, but I am sure he is connected to the team of doctors. Anyway, he comes up to me and says, “Right, let’s see if we can get you sitting up in this chair!”. Good grief – I’ll have you know I have just had major surgery, I don’t do sitting up out of the bed until Day 7, got me? So, he sits me up. I swivvel round and make to hold on to his arms – when he takes his arms away – and says, “No, no, you can do it yourself”. And, just like that – I find myself standing up, placing my hands on the arm of the chair, and sitting myself down. An absolute doddle. Pain? Not a bit. Discomfort? Nope. I felt cheated – Where’s the pain? I’ve just had a Liver Transplant y’know. And then I hear the greatest 3 words in the English Language. Are you serious? You mean I am allowed a cup of tea? Oh, well, eh… yes please. Ladies and Gentlemen – there are times when a cup of tea hits the spot. Well, this was one of those times. Ok, that was pushing it. But I tell you what, my stay in Intensive Care was very brief – later that day I am moved into the normal Ward to continue my recovery. Of course, when I say normal – you will know by now that it was anything but normal. The ward was normal maybe, but the patients – well, let’s just say, within minutes I was hankering to be back beside the boxer – as that felt a whole lot safer! There now follows an account of the great escape of a liver transplant patient from his captors. Today was D-Day – but after last night’s bombshell dropped by @drobeirne that they were unhappy with my latest set of liver results – look I am trying me best here, I cant get it right every time – and so they are going to schedule a TJ Biopsy for today unless the 6am blood test they will arrange shows a marked improvement. 6 a.m. came – and so did the blood man. sneaking up behind enemey lines, waking me with a whisper and drawing blood from this poor defensive soul. There now followed a period of 3 hours of waiting to see if I had worked hard enough to improve my results. At 9a.m. came the answer – in the form of a couple of porters, a hospital gown and an instruction to get changed – we’re going down. I am wheeled down to theatre for the procedure – the TJ procedure – and I am asked “Would you like to be sedated?” Eh, that’ll be a YES then. And the deed is done, I feel nothing… but drowsiness. and I am taken back up to the ward to sleep it off. And I sleep till 14:00. B comes to visit – finds me asleep. Finds me looking a far cry from someone devising a masterplan of escape. Visit over. I am left waiting for the result. Doctor’s rounds. How’s DK? You tell me Doc. Well, DK, you had a good biopsy – you played a blinder. I hold my hand up. I concede. You are free to go – HOME. 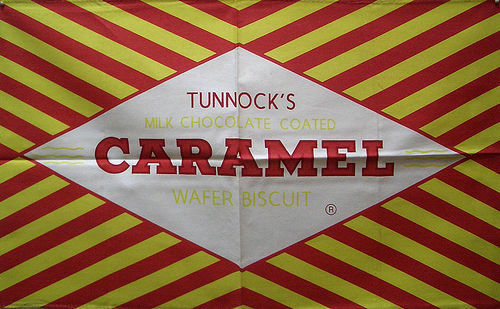 And that’s where I am – just like the old days – laptop on my knee, footy on the telly, tea and a Tunnocks Caramel Wafer (More than 5,000,000 of these made and sold every week). And that sure is heaven to me – ooh wap wap! Oooooooohhhhhhhhhhhhh!!!! !